1933 MG MAGNETTE K1 SALOON PROJECT Registration no. AXB 201 Chassis no. K0370 ALSO FOR AUCTION ON SUNDAY APRIL 7th. 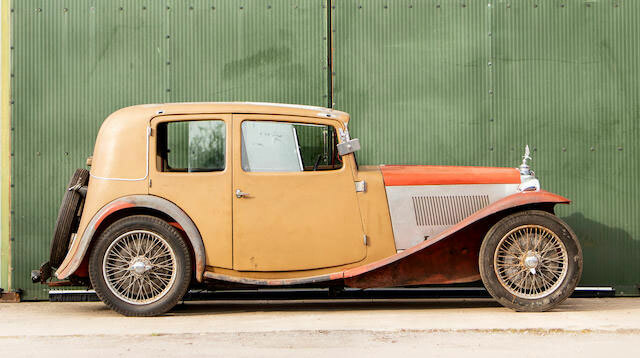 (more pictures are available here https://www.bonhams.com/auctions/25450/lot/46). *Matching chassis and engine *Fitted with the 1,271cc engine *Present family ownership since 1964 *Offered for restoration 'AXB 201' was first registered on 5th December 1933. Little is known of the car's pre- and immediately post-WW2 history prior to its purchase by Mike Waggot in 1964. In poor but running condition when acquired, the MG was used initially before an ongoing restoration was commenced. Elements of the body have been replaced but the original body plate is still in place, and while the chassis is presumed original, the front knuckle has been replaced with one of a different number, possibly following accident damage (it was in place in 1964). It should be noted that the accompanying old-style continuation logbook (issued 1962) records the body number, not the chassis number. We are advised by the private vendor that the chassis and body are in good condition, the former requiring inspection and the latter - currently in primer – in need of finishing, as is the original interior. The gearbox has been rebuilt but has not been tested, while the engine has been dismantled and will require a full overhaul. Offered with sundry bills and a V5 registration document, 'K0370' represents a wonderful opportunity for the MG enthusiast to bring one of these rare early six-cylinder MGs back to its former glory.